Buy this pretty Chinese Sweet Plum with free next working day delivery to most areas. You can choose your delivery date at the checkout. A great fruiting indoor bonsai variety with twisty shape and pretty leaf proportion. 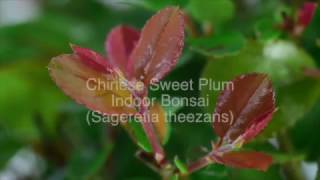 The Chinese Sweet Plum (Sageretia theezans) is one of my favourite bonsai varieties. The new foliage is flecked with red/tan colours, the small purple fruits give more character to the bonsai. It is an elegant bonsai with beautiful proportions. The Chinese Sweet Plum has a lovely S-shaped trunk and potted into a blue ceramic bonsai pot. The Chinese Sweet plum is a very pretty indoor bonsai with great character and easy to care for; it has a lovely S-shaped twisting trunk.